I spent the last week getting over a cold, which meant lots of sleeping during the day and and some time spent at the chemist finding cold medicine in a whole new world of over-the-counter drugs. I felt better on Sunday and took a ferry around Darling Harbour. 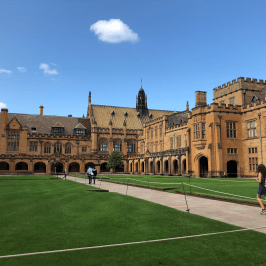 In Sydney, public transport costs $2.60 total on Sundays, so it’s a great day to explore. 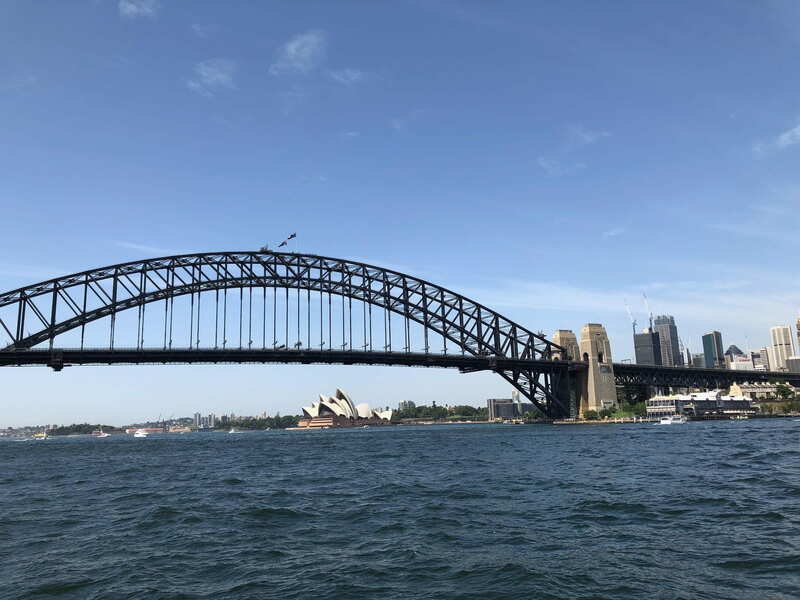 Here is my photo of the Sydney Harbour Bridge (you can see the Opera House, too). The below represents a day when I have lecture in all four of my subjects, which in reality happens only on Monday (an intense start to the week). More realistically, I wake up at 7:30 and run down to breakfast at 7:45. Breakfast at college goes from 6 to 9:30, but all of the best bread products are gone before 7:45 on weekdays, so it’s best to get there as early as possible. Breakfast at college has crumpets, Turkish bread, several types of sliced bread, fruits, and spreads. On Thursdays, there are eggs and bacon (it’s called bacon but really it’s ham). The coffee machine in the dining hall makes lattes, flat whites, cappuccinos, and hot chocolate. It’s a fantastic machine. I take my coffee to go and drink it in my first lecture. 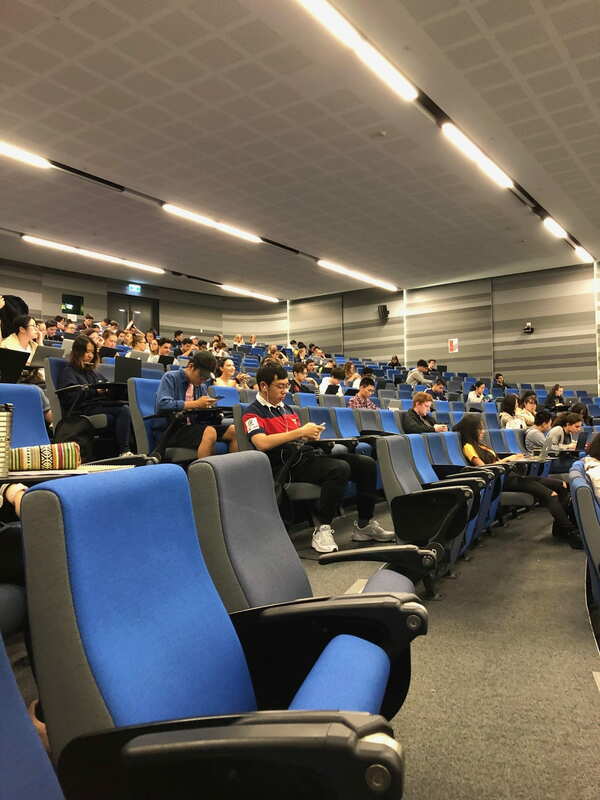 DATA1001 is a huge lecture, but not very many people go (see half-empty lecture hall below) because the lectures are recorded and they happen at 8 AM, when most uni students are sleeping. Each lecture is based on a data story that exemplifies the concept covered in the lecture. Today, we talked about the linearity of the relationship between fathers’ heights and their sons’ heights. PHYS3034 is a class for my biochemistry and biophysics major at Amherst. It is challenging, but probably similar to what I would be doing at Amherst this semester. The lectures go pretty quickly and there isn’t much time for asking questions and spending extra time on difficult concepts. BIOL2029 is a lab course about the biology of cells. So far we’ve discussed cell signalling, cell culture, and types of microscopy. There is an emphasis on interpreting research data and students are expected to spend several hours a week reading scientific papers. I love this class and especially enjoy the four hour practical from 2 to 6 on Thursdays. Right now I’m in the Science and Statistics unit of my psychology course. The professor for this unit, Caleb Owens, lectures about the dangers of embracing pseudoscience and implores the class never to push any of our own pseudoscientific beliefs (because everyone has some superstitions) onto others. In this unit, we’ve learned about logical fallacies, the null hypothesis, statistical power, and general statistical models. Lunch is served at college between 12:30 and 1:30. The college lets its residents pack a sandwich, a granola bar, and a juice box at breakfast when our schedules prevent us from going to lunch in the dining hall. In the afternoons, I have a computational lab, my biology practical, or free time. If it’s a hot day and I’ve spent most of my morning in lecture, I usually take a short nap. I haven’t had many assignments due in the first four weeks of the semester, so I’ve been walking around the neighborhood and getting to know the area. 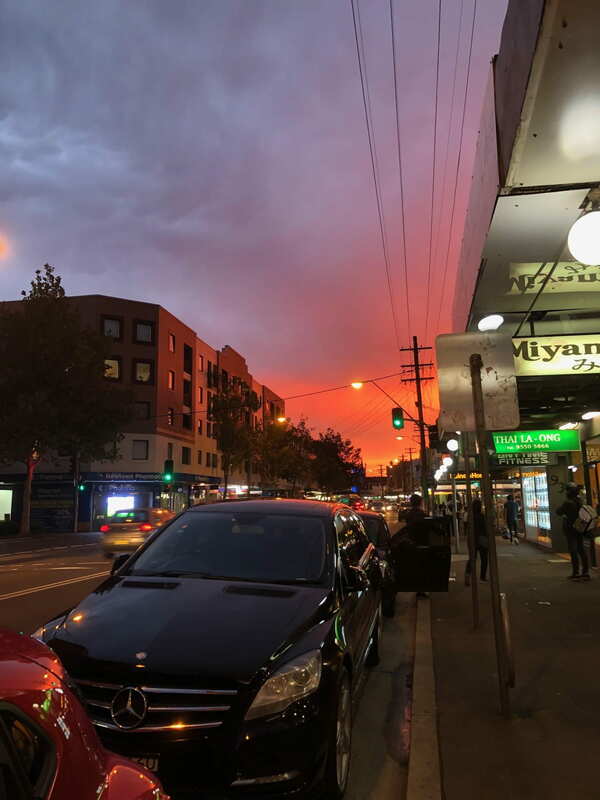 The sunset on Friday was especially beautiful. Dinner runs from 5:30 to 7:15. I usually go at 5:30 because I’m used to early Val. Dinner has a protein-based main meal and rice or pasta. The food is generally quite good. There are two fantastic ice cream shops (Messina and Mapo) nearby, so I go down the street with friends for ice cream a few times a week. 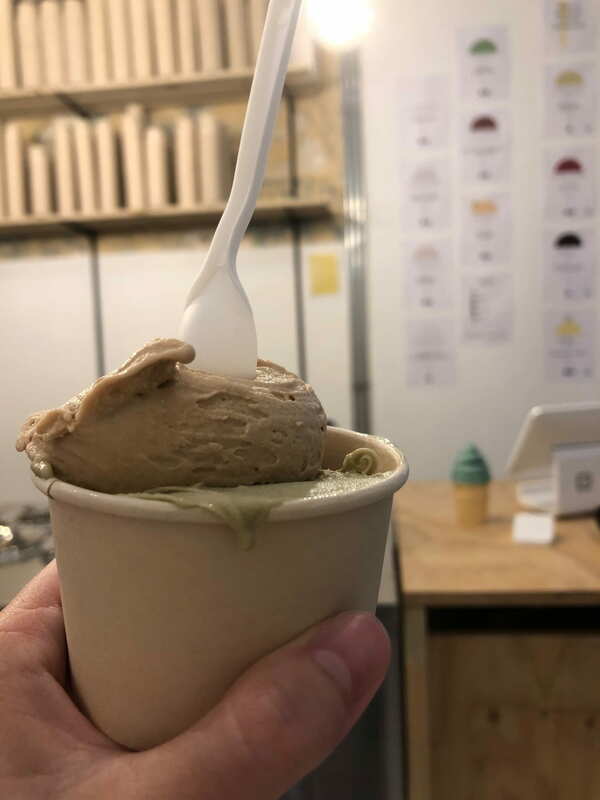 My favorite flavors are pistachio praline from Messina and vegan gianduja from Mapo (hazelnut and vegan pistachio pictured below). The biggest day-to-day difference from Amherst is the rhythm of the week here, which is dictated by the fact that the main party night is Wednesday. This is made possible by the fact that the student bar at the neighboring college is open from exactly 8 to midnight, so even people who go to the party can get to bed at a reasonable hour. Most people at college eat an early dinner on Wednesday night and then spend time with friends before they head out for the night. The Carly Rae Jepsen song “Call Me Maybe” is a favorite pre-pub anthem. Last week, the Wednesday night bar theme was “Party in the USA.” Most people went with a sort of American South country look: lots of bandanas and cowboy hats. This week, I have a plan to watch Riverdale on Thursday with a friend. Thanks to Netflix, bad American television shows have fans even in Australia.